So it still feels like summer here in the South, which truth be told is AOK by me!! However I am itching to wear some fall like items I bought at my FAVORITE Forever 21 store while honeymooning in Charleston. As soon as we ( Dragged the husband along to hold things for me...he's a pretty nice guy) walked in I saw this perfect burgandy midi skirt!! I rushed over grabbed my size and squealed with delight at the price $23 bucks not bad at all!! The material is a dense fabric and it has already held up to multiple washes hooray!!! This mustard raw edge lace top also had to go home with me! 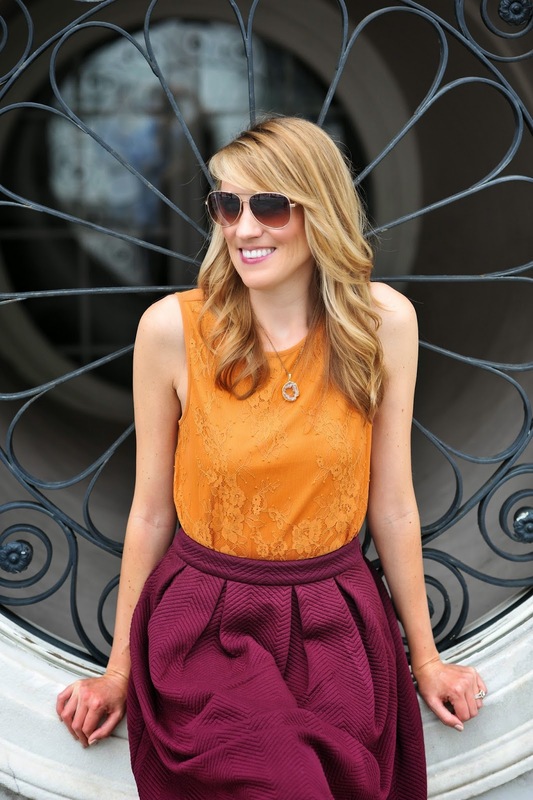 Mustard is one of my favorite fall colors and I loved the way it looked with this skirt!! For our last night on the town I wore this monocratic mixed pattern blouse and skirt combo. The skirt was a bit short so I will be glad to wear it again with some tights!! This shirt has instantly become a favorite of mine which can easily be dressed up or down!!! !